This class teaches owners of electronic or digital sewing machines now to use their machines. It is free for those who purchased their sewing machines from Albany Sewing Machine Center or The Yardstick in Cobleskill within the past 12 months. Other students are welcome for a fee of $35.00. Please register in person or by telephone. Machine instruction for customers who own mechanical sewing machines. Class is free for those who purchased machines from Albany Sewing Machine Center within the past year. Others welcome for a fee of $35.00. Please register in person or by telephone. EMBROIDERY: This class is to teach all new owners of embroidery machines how to use the embroidery functions. The class is free if you purchased your machine from from Albany Sewing Machine Center or the Yardstick in Cobleskill within the past year. Others welcome for a fee of $35. SEWING FUNCTIONS: This class teaches new owners of embroidery machines how to use the sewing functions of their machines. Class if free for those who purchased their machines at Albany Sewing Machine Center or the Yardstick In Cobleskill in the last 12 months. Others welcome for a fee of $35. Create beautiful all-over quilting designs, dynamic crosshatching, smooth lines, curves and several other elements on your domestic machine using the Westalee ruler foot and templates. This interactive class is a perfect introduction for people who are new to ruler work or who want to learn more about this popular quilting technique. 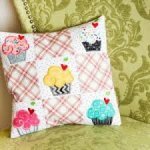 A traditional 9-patch block block becomes the sweetest pillow top with cute applique confections topped by cherry hearts. Practice your multi-hooping skills with this Baltimore-inspired applique pillow. You'll be pleased with how all the pieces of this project line up perfectly! Enjoy making this easy patchwork pouch--the paper piecing is all done by embroidery machine in two fun-to-stitch hoopings. It features an exposed zipper. Create this useful tote to take to the beach. Easy to carry over your shoulder, your beach towel folds into the tote. Finished size is 18-inch x 14-inch without the handles. Learn a fun and unique technique for creating trapunto with your embroidery machine. You'll love the dimension you'll achieve creating a wall hanging that finishes 7-inches x 36-inches. Learn to make a quilt top one block at a time. Let?s have some fun this summer and make a denmin bag to take on vacation this summer. Let?s make a fun summer dress. Mother?s Day is coming up fast, so here is a class for you to make a gift for mom your self! Make a pieced table runner that is quilted in the hoop technique! Join us for open sewing classes here at Sew and Vac! Have an unfinished project, need some advice, want to share your latest project or just to sew with other sewers? This is the class for you. We will also demonstrate a specialty sewing machine foot to inspire you. Registration required, class size limited. Make a tunic out of rayon fabric. This is a woven fabric with a lot drape. Make a tie for your dad or for the man in your life.